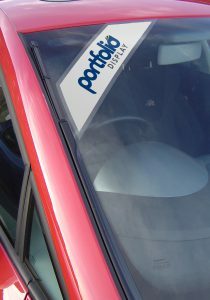 Portfolio Display are pleased to introduce a new product, Premium Magic-cling Windscreen Sashes. Premium magic-cling windscreen sashes are great for displaying in cars, vans and trucks. They make an ideal solution for short-term promotions, warranty and finance offers and brand awareness. These new windscreen graphics are made using a using a special cling-type material. They are applied to the interior or exterior of the vehicles windscreen without adhesive and can be repositioned and used time and time again. They cost slightly more than our adhesive windscreen sashes, but over time they will prove to be far better value, as you can use them multiple times. These highly recommended products use non-adhesive micro-suckers for easy positioning. They will leave no bubbles or creases, just a very professional looking windscreen graphic. This is extremely important for dealerships looking to maintain a professional image. The secret to effective forecourt promotion is not only to make a great first impression, but to make a lasting first impression. Colourful windscreen sashes are so engaging that peoples’ eyes will naturally gravitate towards them. Here at Portfolio Display Ltd we print all of our window sashes in to ensure you get a striking yet vibrant image, which catches the attention. Window sashes can be used both externally on the car forecourt and also internally in car showrooms and event environments. If you think our premium magic-cling windscreen sashes are the perfect solution for you, head over to this page to view and order these premium windscreen sashes.